SINGAPORE (Feb 18): Huawei Technologies Co and the 5G, or fifth-generation, mobile network has been grabbing headlines. US secretary of state Mike Pompeo is reported to have warned European countries that using technology from Huawei could harm their relationship with the US. In Singapore, M1 and Huawei have been in 5G trials together. If M1 is privatised, the spotlight is likely to fall on telecommunications companies such as StarHub and Singapore Telecommunications (Singtel). Telcos are viewed more as dividend plays than growth stocks. Now, with 5G front and centre of newsflow, would capital expenditure for 5G eat into their cash flows and impact their dividends? 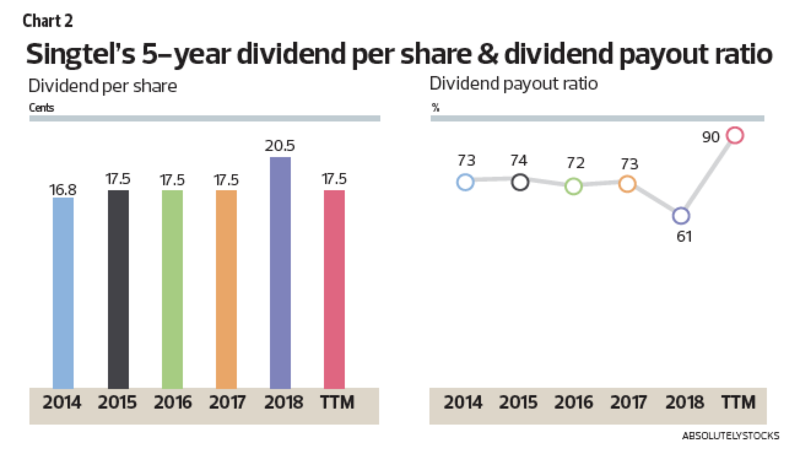 Taking a step back, an investment 10 years ago in Singapore telcos would have resulted in a gain of at least 70% of the initial capital solely from dividend payments. 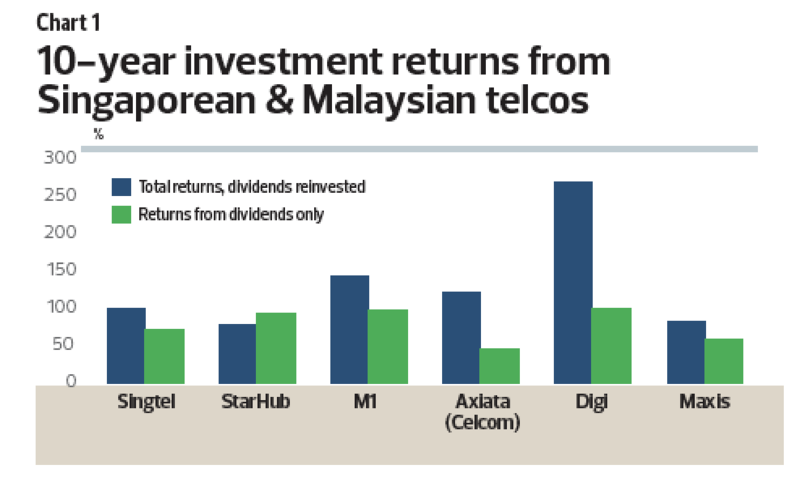 Chart 1 illustrates the lucrative dividend and investment returns from leading telcos in Singapore and Malaysia over this 10-year period. The nature of this industry is changing, however, and its ability to maintain its status as a dividend-paying stalwart is being challenged. Demand for telco services and products is becoming less inelastic, owing to innovation and lower switching costs. Intangibles, particularly intellectual property, are more susceptible to becoming obsolete compared with physical infrastructure, which has high replacement costs and commands relatively large economic moats. Telcos, in particular, are known for heavy capital expenditure spending. They are now likely to invest further in “intangibles”, particularly with the dawn of 5G technology, to stay ahead of the game, and hopefully, maintain their margins. In Singapore, a recurring concern is the regular auction of wireless spectrum by the Info-communications Media Development Authority (IMDA), which caps the profits and cash flow of telcos as they compete for bandwidth. Strategic capital expenditure may not suffice for telcos to sustain their historically lucrative yields, and they would additionally require healthy balance sheets. As the largest local telco, Singtel has significant operations in Singapore and Australia, along with a presence in 21 countries in Asia-Pacific and Africa. It has over 717 million mobile customers. Singtel’s moat, or competitive advantage, lies in its effective stakes in leading telco companies across the world. While this has led to foreign exchange risks, it has also given Singtel a growing market beyond Singapore’s shores. The sprawling group has been paying a dividend per share of 17.5 cents since FY2015 and expects to maintain this level for FY2019 and FY2020 (the company has a March year-end). Beyond that, it would revert to a dividend payout ratio of 60% to 75% (of its underlying net profits). The five-year historical DPS and dividend payout ratio is shown in Chart 2. Among the local telcos, Singtel is by far the strongest financially. Its net gearing ratio currently stands at 25.2%, with an earnings before interest and taxes (Ebit) interest cover of 13.7 times. Despite this, short-term liquidity might be of concern, as it has a current ratio of 0.8. In addition, its cash and bank balances cover only around 37.5% of its short-term debt. Total liabilities is also primarily composed of interest-bearing debt, at 53.7%. But overall, its current assets cover more than four times its current debt, which implies good liquidity. 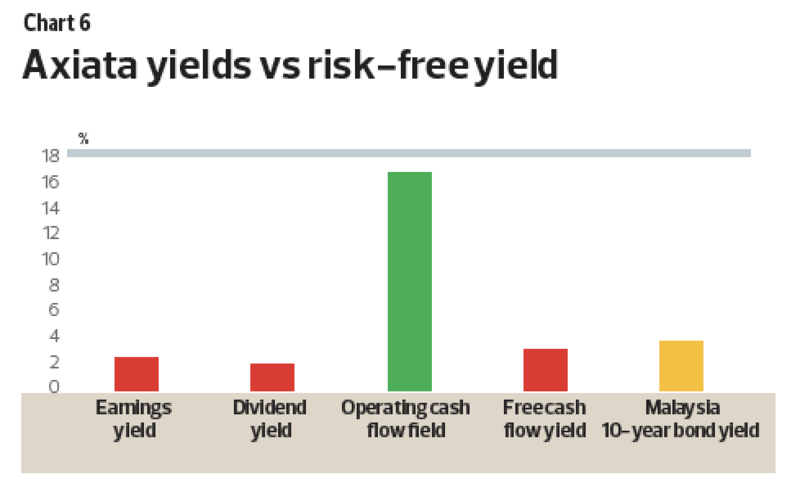 Investors looking for yield may consider staying with Singtel, which remains in a plum position to pay, sustain or even increase its dividends beyond the stipulated dividend policy. It currently has around $24.8 billion in retained earnings and reserves. This is not only enough to cover the total debt of the company, which is around $10.6 billion, but also to pay dividends for at least five years. Looking deeper, the total amount of dividends it needs to pay for FY2019 and FY2020 — at 17.5 cents of dividend per share — would amount to $5.6 billion, which leaves it with another $8.6 billion in reserves. This, however, is presuming it makes no losses and does not overspend on capital expenditure, which can reduce its dividend-paying capacity. Singtel has indicated capital expenditure to be around $2.2 billion, and expects its free cash flow to be around $1.9 billion (excluding spectrum payments and dividends from its associates) for FY2019. The risk for the company is rising capital expenditure requirements to keep up with technological disruption, and regulatory caps on profits from IMDA. 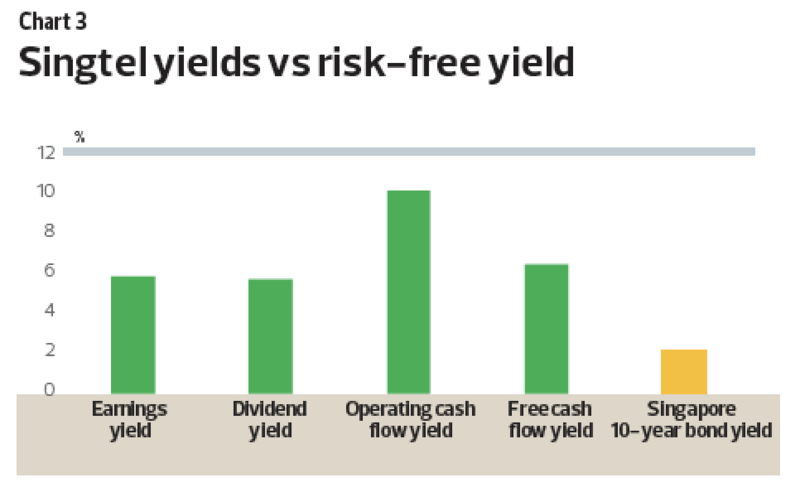 Chart 3 compares the earnings yield, operating cash flow yield, free cash flow yield and dividend yield against the risk-free rate, which is represented by the Singapore 10-year bond yield. This implies that Singtel is attractive at its current trading price of $3.03. Starhub’s dwindling cash holdings and retained earnings has forced it to change its dividend policy. As at FY2019, the company is likely to adopt a variable dividend policy, with a dividend payout ratio of at least 80% of net profit. “As part of the transition to the new dividend policy, the group intends to pay a dividend of at least nine cents per share for FY2019, at a rate of 2.25 cents per quarter,” StarHub announced. Temasek holds a 56% stake in the company, the No 2 local telco by market share. StarHub has paid a DPS of four cents for 4QFY2018, taking full-year DPS to 16 cents per share, similar to its FY2017 dividend. 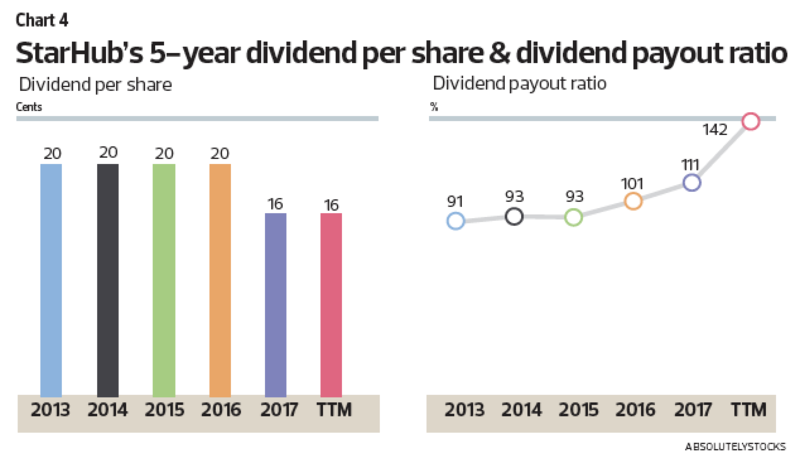 Chart 4 shows the company’s five-year historical DPS and dividend payout ratio. Unfortunately, its dividend payout ratio has been rising steadily as its DPS has been falling. This is clearly untenable. Shareholders have been receiving a DPS of five cents per quarter since FY2010. It is concerning that StarHub is using retained earnings and reserves to maintain its historical dividend policy, and this payment is actually lower than it was from FY2010 to FY2016 (see Chart 4). StarHub’s net gearing ratio is at 146.7%, with an EBIT interest cover of 11.4 times. While its earnings are able to cover interest expense, the capital structure is somewhat weak. In 2QFY2017, StarHub issued $200 million in perpetual securities that have a call date of June 2022. The perpetual securities comprise up to 34.7% of the total equity base; and only $52.2 million, or 8.9%, of the total equity is made up of retained earnings and reserves. On the other hand, StarHub’s cash and bank balances are sufficient to cover its short-term debt, but only 16.1% of its total debt. Short-term liquidity is reasonable, with a current ratio of 1.07 and current assets being able to cover 90.5% of the total debt. StarHub has announced that it expects capital expenditure to be at 11% to 12% of total revenue for FY2019, excluding spectrum payments of $282 million. The presence of a fourth telco in Singapore, Australian TPG Telecom, may cause StarHub to increase expenses to maintain market share in the mobile sector, which is its main revenue-generating segment. 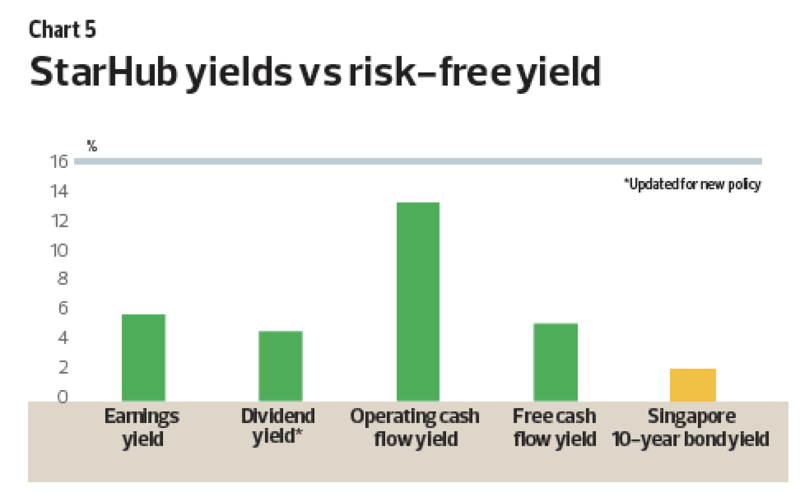 Given its balance sheet position, StarHub’s seemingly attractive yields, at a current trading price of $1.91, as shown in Chart 5 should be viewed conservatively against its financial position, capital expenditure and dividend policy. M1 is in the midst of a privatisation offer from Singapore Press Holdings and Keppel Corp. SPH and Keppel Corp collectively own around one-third of M1 and have offered to buy over the rest of the outstanding shares, which they have valued at around $1.9 billion. Bursa Malaysia-listed Axiata Group is currently the single-largest shareholder of M1, with a 28.7% stake. The offer is at $2.06 per share. Axiata stands to gain around $550 million (RM1.7 billion) from this offer should it accept it, reducing its gearing ratio and improving its liquidity position. Charts 6, 7 and 8 show the current yields for the Bursa Malaysia-listed telcos Axiata Group, Maxis and Digi.com. Maxis’ and Axiata’s dividend yields are not attractive, and Digi.com’s is only marginally attractive as compared with the risk-free rate. However, the other fundamental yields are reasonably attractive for Maxis and Digi.com at a trading price of RM5.70 and RM4.58 respectively, but poor for Axiata at a trading price of RM3.95. NetLink NBN Trust, a business trust, provides returns to investors in the form of distribution yield. Its policy is to distribute 100% of its distributable income semi-annually. It was listed in July 2017 at 81 cents, and last traded at 80 cents. The trust’s manager has guided for a distribution per unit of 4.88 cents for FY2019 (it has a March year-end), and has already paid half of this amount for 1HFY2019. Temasek owns a 27.5% stake in NetLink NBN Trust largely through Singtel, which holds a 24.79% stake. NetLink NBN Trust owns a unit, Netlink Trust (NLT), which builds, designs, operates and owns the fibre network infrastructure across Singapore. This network consists of ducts, manholes and fibre cables for residential homes and non-residential premises as part of the Next Generation Nationwide Broadband Network plan. NLT’s business model is centred on recurring revenue, particularly for its fibre business, which is its main revenue generating segment. NLT distributes 90% of its distributable income to NetLink NBN Trust, retaining 10% for capital expenditure. Liquidity and solvency ratios indicate a relatively healthy financial position for NetLink NBN Trust — it has a current ratio of 2.68 and a net gearing ratio of 17.7%. Ebit interest cover is at a comfortable 5.3 times. Chart 9 shows the trailing 12-month yields for NBN NetLink Trust. 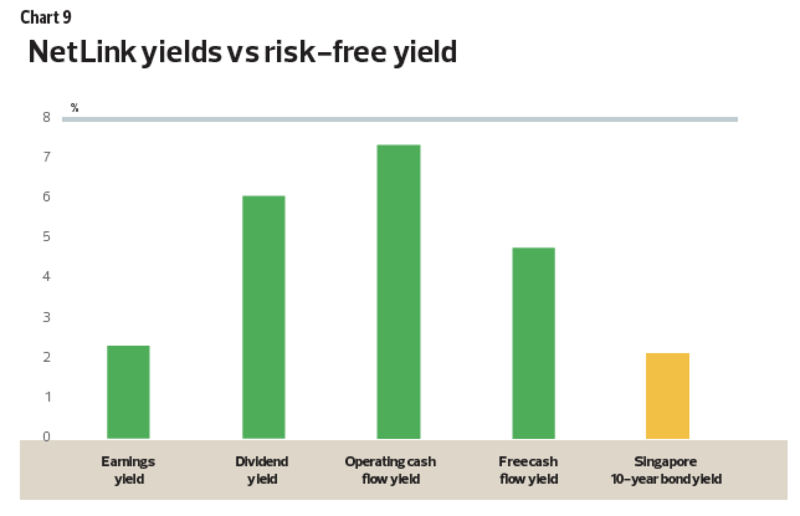 The cash flow yields are attractive, as is its distribution yield of 6.1%.